Learn the Repair of triceps rupture surgical technique with step by step instructions on OrthOracle. Our e-learning platform contains high resolution images and a certified CME of the Repair of triceps rupture surgical procedure. 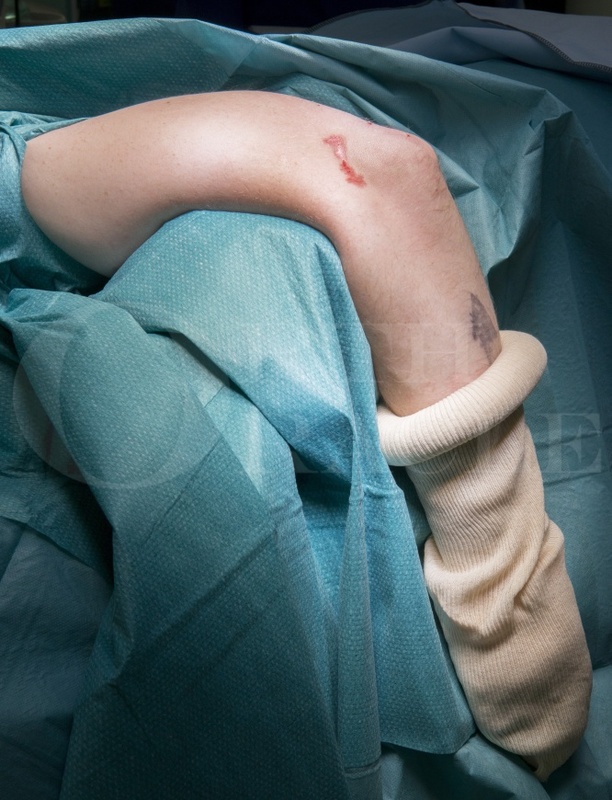 Triceps tendon ruptures are rare injuries and account for less than 1% of tendinous injuries. They usually occur as an avulsion from the olecranon, although intramuscular and musculotendinous ruptures have also been described. These injuries are more common in males and usually occur as a result of a forceful eccentric contraction in a flexed elbow. This occurs for example when weightlifting or falling onto an outstretched arm. It has been associated with systemic diseases including metabolic bone disorders, anabolic steroid use, local steroid injection, fluoroquinolone use, chronic olecranon bursitis and previous triceps surgery. Due to the rarity of these injuries the published literature contains mainly case reports, although there are some case series. Numerous surgical techniques for repair have been described in the literature which are predominantly variations involving either a trans-osseous suture repair or suture anchors. My preferred technique (based on its biomechanical robustness ) is as described by Clark et al. This involves running 2 locking Krakow stitches to the distal triceps tendon and passing them through two parallel bone tunnels in the olecranon. This is then re-passed through the bone tunnels to provide a double row type repair before securing the sutures using a 4.75mm Swivelock anchor. I favour this technique as it has a higher strength in load at yield, higher peak load, and less displacement of the repair on cyclical loading when compared to a transosseous ruciate suture repair (Clark et al. Distal Triceps Knotless Anatomic Footprint Repair Is Superior to Transosseous Cruciate Repair: A Biomechanical Comparison Arthroscopy. Arthroscopy 2014). It also minimises the foreign material at the triceps tendon footprint when compared to techniques using suture anchors. This is to optimise conditions for integration of the primary repair. It is theoretically more biomechanically robust than techniques using anchors orientated in the direction of pull of the triceps tendon.